As is the case with other languages, Russian has long made use of acronyms. They are particularly common when it comes to ideology and it is virtually impossible to discuss the Russian political system without using them. Immediately following the revolution of 1917, Russia ceased to be called Russia, and was renamed to the RSFSR or Russian Soviet Federative Socialist Republic. However, Russian émigrés refused to accept this change and mockingly referred to it as Sovdepia, a combination of the words Deputy and Soviet, which alluded to the governing body of the RSFSR, the Soviet [or Council] of Deputies. After the establishment of Soviet rule in the Caucasus and Central Asia, several other republics were added to the RSFSR, and the country became known as the USSR, or Union of Soviet Socialist Republics. This name was used until 1991 when the USSR broke up into fifteen independent states. Following the dissolution of the USSR, Russia once again took on its traditional name. However, the term Russian Federation or RF is also considered acceptable. The former Soviet states also periodically form various alliances known under other acronyms; these include the CIS (Commonwealth of Independent States) and the recently founded EAEC (Eurasian Economic Community). 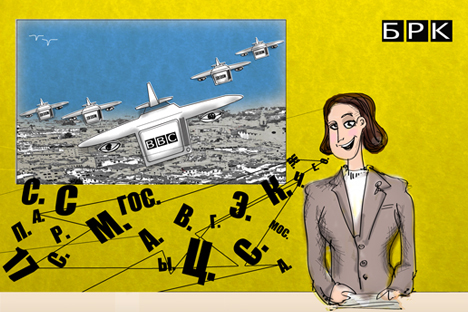 Some international acronyms are used in Russian without translation; examples include NATO and the BBC, which if translated into Russian would be abbreviated as BRK. Curiously, if the abbreviation BBC is read in Cyrillic, it becomes an acronym used to refer to the Russian Air Force. Acronyms are also traditionally used to refer to political parties. The USSR had only one political party, the CPSU, or the Communist Party of the Soviet Union. However, until the early 1950s, it was called the AUCP(B), or All-Union Communist Party (Bolsheviks). The first “alternative” political party during the Perestroika years was the LDPR or the Liberal Democratic Party of Russia, while one of the modern political parties, the People’s Freedom Party, is known for its Russian syllabic abbreviation PARNAS. In modern Russia, the letters GB have lost their terrifying association with the acronym KGB. For example, today the enormous Russian State Library, which is located next the Kremlin, is known as the RGB. It was previously known as the V.I. Lenin Library, but has long been renamed. Curiously, the nearest Moscow subway station, which was built back in the 1930s, is still known as the V.I. Lenin Library Station. The name of another subway station, meanwhile, has undergone a paradoxical metamorphosis. In 1939 the All-Union Agricultural Expo Centre or VSKhV was opened in northern Moscow, and when the subway line was extended there in the 1950s, the nearest station was given the same name. Shortly afterwards the expo centre and the subway station were renamed to the Exhibition Centre of the Achievements of the National Economy or VDNKh. After the collapse of the USSR the centre no longer served an ideological purpose and became a regular trade centrе named the All-Russia Exhibition Centre or “VVTs”. However, the station was not renamed, and over time its name became synonymous with the surrounding city district. Consequently, in order to get to “VVTs you must first go to the VDNKh.